Look for help in your own backyard. Ask around your organization and see if anyone has project management materials or experience to share with you. Has your company adopted a specific method they want everyone to use? Does your company have training available? Do they maintain a knowledge base of best practices related to specific projects or project management? Do you have any in-house subject matter experts? Does someone know of a project management book specific to your industry that would help? Do a little digging in your yard and you might be surprised what you find. 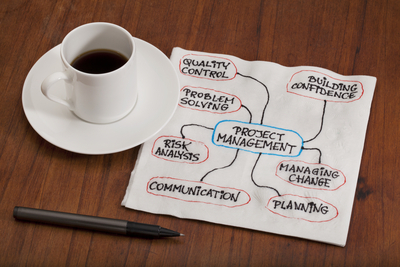 There are a number of online resources available dedicated to the topic of project management. The target audiences range from layperson to industry expert. One site that provides free online resources geared mainly to the layperson is listed below. (#1) All About Project Management. The author of this site is a certified Project Management Professional (PMP). Topics on the site include an overview of project management as well as information on all major phases of project management. She also has general resource links to glossaries, tools, references, and professional organizations. All right, brace yourself: there are loads (and we do mean loads) of books on the topic of project management. Again, some books are for the novice, and some books are obviously for experts or practitioners in the field. In addition, there are project management books that focus on specific industries (e.g., project management as it relates to software development, engineering, etc.). Frankly, the sheer volume of information available is overwhelming. To help you through the morass of options, we’ve looked at few of the most popular ones on the market. These books are for those of you who need to manage a general project, but are not looking to be the next Gantt or Fayol. The books have two key features in common: credentialed authors and content matter. First, all authors are project management (PM) professionals. Some have a certificate from the Project Management Institute (PMI). All have managed large complex projects across multiple domains, managed their own consulting companies, and most have taught the subject in some capacity. They know their stuff. With respect to content, the books cover the entire project management cycle from time of first assignment to closeout. While the authors might label the steps differently, the backbone process is essentially the same and all are linked to the industry gold standard delineated by the PMI. In general, each author starts a section with an introduction or overview of content (in some cases learning objectives), presents content with tips, cautions, or anecdotes to support ideas, and wraps up with a summary. Two features differentiate these books: content delivery or style and level of detail – sort of breadth versus depth, if you will. Differences are noted after each of the titles. Books are listed alphabetically by author. So the order does not suggest “better”, “more better”, or “most bestest ever!!”. Yes, you guessed it: you will need to decide what works best for you based on your individual project needs, personal learning style, and resource constraints. We suggest you review the books online by downloading a sample, or in person at your local library or bookstore prior to purchasing. This will enable you to evaluate which book best suits your needs. Again, check to see what your organization has available first! Don’t reinvent the wheel or buy something you can get in-house for free. (#2) Horine, Gregg (2013). The Absolute Beginner’s Guide to Project Management (3rd edition). Que Publishing, Indianapolis, IN. Written in a personable and light-hearted style, this book is akin to having an instructor “teach” you the content. The author assumes the reader has no prior experience in PM and has no access to specific tools or methods. The author states each section can be easily absorbed in 30 minutes or less and that each is stands alone. (#3) Kemp, Sid (2004). Project Management Demystified. The McGraw-Hill Companies, Inc., NY, NY. Yes, it’s a bit more “mature” than the others in this list, but I liked this book because it is written as a self instructional manual. It’s very easy to read and provides interesting case studies and anecdotes along the way. The author simplifies the project management process into analyze, design, develop, and do (produce). Great for the novice PM and the author highlights areas from which the more experienced PM would benefit. (#4) Portny, Stanley E. (2013). Project Management for Dummies (4th Edition). John Wiley & Sons, Inc., Hoboken, NJ. Okay, between you and me I find the titles in this series insulting. Very cheeky if you ask me. None of us are dummies. That said, once I unruffled my feathers and looked at the book, it does present information clearly and concisely. In the overview on PM, the author defines the role of a PM and the knowledge, skills, and abilities a good PM must possess.For those considering more serious training in PM, each chapter contains a summary of how the book links to the PMP exam and PMBOK (see Ultra Serious Bits, below). The author presents a couple of nice quick references at the end of the book in the form of 10 questions you need to ask as you plan your project, and tips to help you be a better PM. Examples and case studies are used throughout. It provides more depth than Kemp or Russell. One other positive, these books are updated on a regular basis. (#5) Russell, Lou (2007). 10 Steps for Successful Project Management. American Society for Training and Development (ASTD). ASTD Press, Alexandria, VA. This book is for the accidental PM who needs are simple. This is more a job aid rather than reference text. It provides just enough to get you through a project quickly with minimal fuss. Easy to read and use. Members and associates of The American Society for Training and Development (ASTD) produce quality materials and research in many areas related to PM (e.g., team building, communication). When you have a moment, take a look and see if they have anything that might be of assistance. Stung by the project management bug? Want to learn more? For those of you interested in developing expertise, obtaining a professional certification in, or investigating current research in project management, check out the following professional societies. (#6) International Association of Project Management. (#7) Project Management Institute (PMI). PMI is recognized world wide as the certification agency for PM professionals. They are responsible for the Project Management Professional (PMP) certification and maintaining the Project Management Body of Knowledge (PMBOK) book documenting the industry’s standard practice for PM.